Large herbaceous, glabrous (except ovary) perennial climber, up to 15 m.
Stems ± terete, striate; internodes up to 9 cm. long. Leaf-lamina up to 13 × 15 cm., 3-lobed to below the middle of the lamina, the lobes 2–4 cm. wide, acute or acuminate, rarely subobtuse, serrate, rounded or shallowly cordate at base, subcoriaceous, pale green or yellow-green, glossy above, paler and not glossy beneath; petiole up to 4 cm. long, with 2 glands at the apex, the glands sessile or shortly stipitate; stipules c. 10 × 1 mm., linear-subulate, entire or minutely glandular-serrulate. Tendrils c. 10 cm. long, stout, simple. Peduncles up to 6 cm. long, stout. Bracts 2–2·5 × 1–1·5 cm., ovate, obtuse or acute at the apex, serrate, pectinate or almost lacerate, often glandular at margin. Flowers solitary, up to 7 cm. in diam. 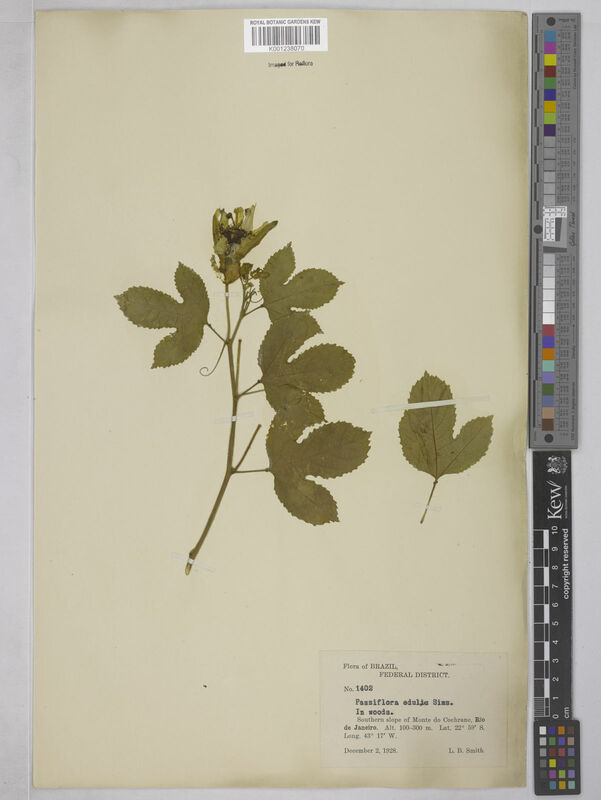 Sepals 3–3·5 × 1 cm., oblong, horned, green outside, white inside. Petals 2·5–3 × 0·5–0·7 cm., oblong, obtuse, white. Corona with the filaments in 4 or 5 rows, those of the 2 outer ones 1·5–2·5 cm. long, filiform or narrowly liguliform, crispate towards the apex, white, purple at base, those of the other rows 2–2·5 mm. long, linear or dentiform. Operculum membranous, incurved, entire or shortly fimbriate. Limen cupuliform, entire or crenulate. Ovary ovoid or globose, sericeo-tomentose or glabrous. Fruit 4–5 cm. in diameter, ovoid or globose, yellow, greenish-yellow or purplish. Seeds 5–6 times; 3–4 mm., ovoid, minutely reticulate. Nativa y cultivada en Colombia; Alt. 0 - 2000 m.; Amazonia, Andes, Pacífico, Valle del Cauca, Valle del Magdalena. Climber to ± 15 m., perennial, glabrous throughout (except ovary); stem sometimes ± angular. Leaf-blades 3-lobed up to three-fourths, rarely unlobed, suborbicular to broadly ovate in outline, 5–11 by 6–12 cm., base acute to cordate, 3-nerved from base, subcoriaceous; lobes elliptic to oblong, up to 8 cm., top acute, shortly acuminate; margin serrate; petiole 1–4 cm. Glands on petiole 2, wart-like, at transition to or up to 0.5 cm. below the blade; blade-glands absent. Stipules lanceolate-linear, ± 1 cm. Inflorescences 1-flowered, the straight peduncle (pedicel) 3–6 cm., inserted beside a simple tendril 5–20 cm. ; bracts and bracteoles ovate, acute, 1.5–2 cm., glandular-serrate, forming an involucre. Flowers 4–7 cm. in diameter, white, corona threads purplish towards base. Hypanthium cup-shaped, ± 1 by 1–1.5 cm. ; sepals oblong, 2–3 cm., corniculate. Petals oblong, 1–2.5 cm., obtuse. Corona composed of several series of threads, the outer 2 series 0.5–2.5 cm., the inner ones much shorter; operculum membranous, incurved, crenulate-fimbriate; disk (limen) cupuliform, entire or crenulate. Androgynophore 6–8 mm., thickened towards base. Filaments subsubulate, 6–8 mm. ; anthers 8–10 mm. Ovary subglobose to ellipsoid, 3–5 mm., glabrous or shortly pubescent; styles 10–12 mm. Fruit berry-like, with coriaceous-leathery pericarp, globose to ellipsoid, excluding the 0.5–1.5 cm. long gynophore 4–5 cm. in diameter, glabrous, yellow or purplish. Seeds many, ellipsoid, 5–6 mm. 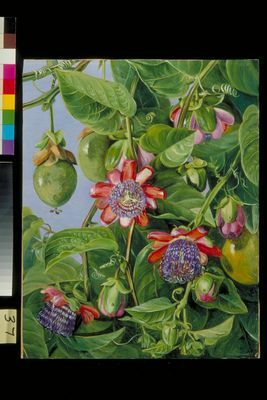 Often cultivated for the flavoured fruit and escaped in forest edges, thickets and disturbed places; 0–2500 m.
Passiflora edulis var. pomifera (M.Roem.) Mast. Passiflora edulis var. rubricaulis (J.Jacq.) Mast. van der Burg, W.J. (2014). Passifloraceae Flore du Gabon 46: 54-94. Muséum National d'Histoire Naturelle, Paris. de Wilde, W.J.J.O. & Duyfjes, B.E.E. (2012). An enumeration of Sabah Passifloraceae, with a revised key to Adenia species Sandakania 18: 1-14. Morat, P. (ed.) (1998). Flore de la Nouvelle-Calédonie et Dépendances 22: 1-91. Muséum National d'Histoire Naturelle, Paris. de Wilde, W.J.J.O. (1975). 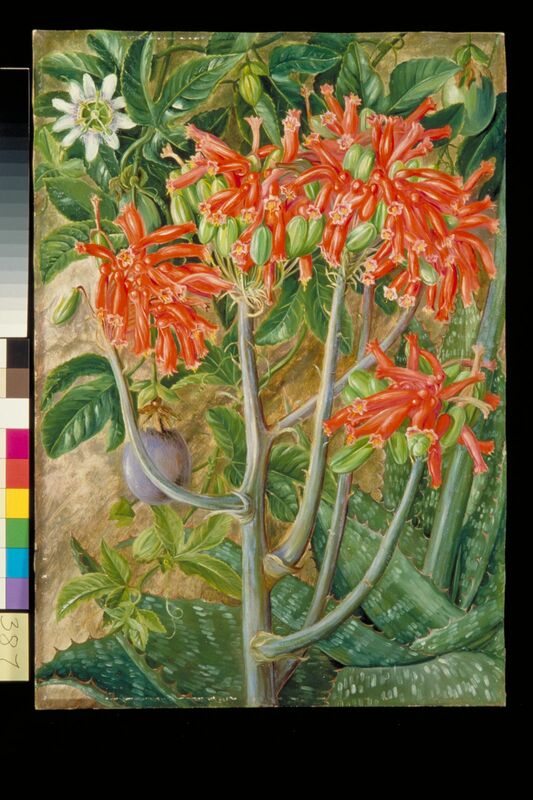 Flora of Tropical East Africa, Passifloraceae: 1-70. Killip in Field Mus. Nat. Hist. Chicago, Bot. 19 : 393 (1938). Sims, 4.in Bot. Mag. 45, t. 1989 (1818).